Time for another family budget update! The big news this month is that we’re finally taking an income (albeit a very small one) from the rental apartment above our garage. Before we had renters, we spent a few thousand dollars on repairs to get the apartment ready. That came out of our family budget since we didn’t yet have rental income. In the last year we’ve had renters in the apartment, and have paid utility and maintenance expenses from the incoming rent, but left the remainder of the rental income in a separate rental account, waiting for it to accumulate to cover the cost of our initial pre-renter repairs. In May we broke even, so in this month’s budget we’re paying the family budget back for our initial repair costs, and recognizing a $187 profit on the rental. We should see some profit there most months in the future, as long as we have it occupied. The rest of our budget, including numbers for the rental, is below. Check out the video below to watch me walk through our actual May budget in YNAB. Otherwise, you can keep reading to get all the details of our monthly income, spending, and saving! Okay, onto the numbers from May 2018! Our total income for May was $9,692. Since we live on last month’s income, this is money that we’ve been holding to start spending in June. Attorney Income (Private Practice)– $740 On top of working full-time, my husband has a part-time private law practice on the side. He started it to help speed up our debt payoff and because he had clients from his days at a small firm that didn’t want to let him go. This income fluctuates greatly from month to month. My Income (Blog)– $2,456 The income that I report is the income that I received this month minus all of my blogging expenses. Of this, I’m setting aside 25% for taxes ($614) and distributing $1,842 to the family checking account as my paycheck. I use Blog Finance Spreadsheets to keep track of everything. I get a lot of questions about what sort of training I had that helped me learn how to earn money blogging. While technically there’s no training required to blog, it’s definitely easier when you’ve got someone showing you step-by-step how to do it successfully. I went through Elite Blog Academy back in 2014, which really helped set me up for success. It’s only open once a year, but you can download the 2018 Blogging Trends Report, which will get you on the waiting list. Rental Income- $187 In May we reached the point of profitability with our rental. It’s not very much this month, but we’re excited to have finally paid ourselves back for the work that we put into the rental (more on this in the rental section below). Our spending in May came from the income we earned in April. Here’s how we spent money in May. Tithing– $1,020— We happily pay a 10% tithe on our total income from the previous month. You can read more about why we paid tithing, even when we were in debt. Mortgage– $3,200 We recently refinanced our mortgage from a 30-year to a 15-year mortgage. If you want to see all the numbers and read about why we did it, read this post that my husband wrote explaining everything! Electricity– $290 Our electric bill is for two households, as our renters are on the same meter. We haven’t used the heat or air for a while, so this is mostly from the water heater, lights, washer/dryer, fridges, etc. Home Phone- $4 Since my husband works at home a day or two each week, we decided to get a home phone for him to use. It’s Ooma, which is internet-based, not a traditional land line. The monthly service charge is minimal ($4) and the initial set-up (hardware, etc) was under $100. If you think Ooma might work for you, that link will also get you a $20 Amazon gift card! Republic Wireless Cell Phones– $13 We’ve been using Republic Wireless as our cell phone carrier for over three years now. This covers the cost of service for my phone, including all taxes and fees. (We’re on the Republic Refund plan from a few years ago which is no longer available; an equivalent plan for a new user today would be $20/month). My husband also has a Republic phone which he uses for his private practice, but that’s a business expense, not a family budget expense. If your cell phone bill is killing you, I definitely recommend that you check out Republic Wireless! UPDATE– There is a summer offer where you can get 3 months of service free! Check it out! Food– $426 This year I’m sharing exactly where our food budget goes. At the beginning of May I shared our monthly grocery shopping trip that where we spent $360 (90% of our budget!). Later in the month, we spent another $40 total. Then in the last two days of the month we spent another $26– I splurged and bought a big box of ice cream bars at Sam’s Club and my sweet husband went out for lunch (something he almost never does) and treated a homeless man he met on his way. Gas– $465 Gas around here is at $3.45/gallon. California’s “summer blend” of gas is more expensive than what they sell in the winter. My husband commutes over an hour each way 3-4 days a week, so a lot of our gas budget is used there. It will be interesting to see how this changes now that I won’t be doing school-related driving for the summer. Clothing– $89 I bought a new swinsuit for myself, new running shoes for my husband, some Sunday clothes for the boys (Easter clearance), and some shorts and capris for me. Household– $193 I stocked up on laundry soap in May! I was super excited to find that Purex laundry detergent at Walmart had $3 off 2 peelie coupon on the bottle on top of a $2 Ibotta rebate! The Ibotta rebate is still there, too! (If you’re new to Ibotta, use this link or put in code wqiyxfa to get a bonus $10 back when you redeem your first rebate). I also got new laundry baskets which I’m in love with! I got two sets of 4 for less than $16 per set! I bought several new cloth diapers from Alvababy. Some of the original cloth diapers I bought 6 years ago leak or have elastic that wasn’t stretchy anymore. There were a few other random purchases from the thrift store and a new kind of carpet cleaner solution. Fun– $177 I had decided against getting a pool pass this year, but hours before the early bird special was ending, I decided to go for it. I will be the main one taking the kids (ten years ago I never thought I would be down with taking five kids to the pool by myself), so it was up to me whether we would get passes or not. We also ate at In-n-Out on a date night and had ice cream for a family treat. Animals– $26 We bought a 44 lb bag of cat food. Since we stocked up on chicken feed in April, we didn’t have to buy any this month. Tax Prep– $90 Our tax advice and preparation plan allows the cost to be spread over the year. Some people wonder why we pay so much for this (a total of $1080 a year), and that’s a valid question. We prepared our own returns for years, but in the last few years, as our income sources have been varied, we’ve found the planning and preparation more than pays for itself in minimized tax payments (actual dollars saved), not to mention to the additional peace of mind. Kids Activities– $40 We bought a gift for my son’s wrestling coach (a $50 Coldstone gift card we got at Sam’s Club for $40). The coach has been running an after school program for interested kids for free–he’s not getting paid by the school or the participants. Since he’s been taking time away from his own family to help our wrestler, we wanted to give him something he could enjoy with his family. Home Projects– $0 We didn’t add anything to our home project fund, but we did spend $115 on a second living room ceiling fan to match the first (which we bought with a gift card last year). We have $839 remaining in the home projects sinking fund. Dental– $30 We have $150 in dental right now. Medical– $100 We had a few visits, but they were the kind without copays. Our current balance for medical is $501. Car Repair– $300 We spent $841 in May for a tune up for my husband’s car and new rear brake pads and rotors for the van. The current balance in our car repair fund is $302. Car Registration & Smog– $40 We currently have $144 in this fund. Christmas– $100 We currently have $500 in our Christmas fund. Gifts– $40 We spent $45 on teacher gifts. Our current balance for gifts is $118. Vacation/Family Reunion– $200 We have a family reunion coming up in Las Vegas in July, so we’re setting aside some money for that trip! Anyone want to share some of their best fun and frugal activities for families in Vegas? We currently have $509 in this category. Our savings goal for 2018 is $26,000 ($15,000 toward our emergency fund and $11,000 to my IRA). At the end of May we are at $16,400, which is 63% of our goal! Our goal for 2018 is to reach $25,000 in our emergency fund (we started out with abour $10,000 at the beginning of the year). In May we put $5,009 (about $1,600 from our normal budget and the rest from paying ourselves back for rental expenses we initially took out of our family budget, see below) which makes the current total $19,572. In May we contributed $550 to my IRA. We decided to automate this contribution each month so that by the end of 2018 my IRA will be maxed out. As you saw above, we have reached the point where our rental unit is profitable. Up to this point we have been saving all the rent money up to pay ourselves back for what we put into the place out of pocket when we first started renting it. For a detailed explanation, check out the bottom section of last March’s budget update. To pay ourselves back (partially), we transferred $3,214 to our family budget, and sent it directly into the family emergency fund. We left an additional $2,000 (of money that we “owe” to our family budget) in the rental account as a little emergency fund specifically for the rental. 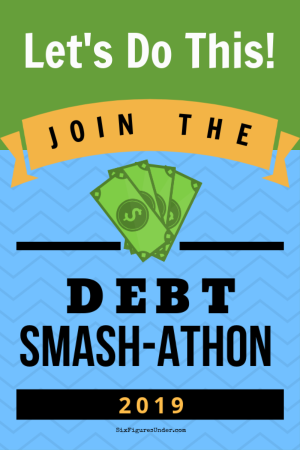 I’d love to hear about how your budget and/or debt repayment went in May! Any tips for what to do in Las Vegas for families with young kids? « Where Do You Keep Your Emergency Fund? A family reunion in Las Vegas sounds fun. My husband went for a conference two years ago and did hiking out by Red Rock Canyon. They also went to the strip one night. He said it was fun just walking and people watching. The Bellagio has a garden and fountain that he thought the kids would enjoy. Our May was good. After years of me suggesting we move out West (back out West for me) my husband agreed that now is the time to do it. We’ll be moving to Reno when our lease is up at the end of July. I can’t wait to introduce my children to the magical place that is Lake Tahoe and the Sierra Nevada. I’ve never been to Las Vegas. My parents hated it; my husband liked it because of all the cheap food in the casinos; but since kids aren’t allowed on the floor that probably won’t help you much! But in nearly every city around the world you can almost always get free entry to religious buildings, parks, and government buildings. Since Las Vegas isn’t a capital city the third one probably won’t be much use to you (capitals can be fun to visit, but city halls are generally not) but that still leaves religious buildings (I’m sure the kids would enjoy visiting the temple grounds) and parks, which often have fun little gems to discover (playgrounds, water play pads, statues, lakes with birds to feed, sometimes even zoos or cottages to explore.) Many cities also have free or almost-free art, history, or cultural museums – nothing like sneaking in a bit of edumacation on holidays! Don’t forget to look at the offerings from local universities; classes might be out but their art and science museums are probably still open to the public. A quick Google of UNLV museums turns up quite a long list, including an art museum and a herbarium. May was fun. We spent the end of the month and the first few days in June in Tasmania, which is one of my favourite places in the world. We saw wild wallabies, pademelons, and wombats right up close (as in, so close we could’ve touched them) and I even saw a Tasmanian devil on the side of the road (alive, not dead.) We visited two Unesco World Heritage sites, including an old penal colony from the transportation days. Here’s a fun fact to throw out at your kids the next time they’re misbehaving – in the 1800s, children as young as 7 could be tried as adults, and children as young as 9 could and were transported. The youngest boy transported from England to the boy’s prison in Tasmania was 9 and a half. He had stolen, at his parents’ direction, three boxes of toys, and while they apparently were not punished for it, he was sent, on his own, halfway around the world to serve out a fairly lengthy sentence on a remote and isolated island, with his closest neighbours off the island being hardened criminals. The poor kid lived for another 70 years and spent his life as an alcoholic, in and out of prison for various crimes. Really, what chance did he have? We also heard about a criminal who tried to escape by crawling inside a dead kangaroo and hopping away. He was caught when soldiers tried to shoot the kangaroo for food. I’m not quite sure I believe that one; but it sure made for a fun story! I have been wondering why you haven’t started a 529 account for your youngest yet? hooray for finally seeing a profit on your rental! That’s such great news! And way to go re: the savings goals – 63 per cent at the midpoint of the year isn’t too shabby at all! We had a really great May! Thanks to five-pay May (hubby got paid twice, I got paid three times) we were able to make a really significant payment on our credit line – $1,550! We’re taking a little break in June to allow us to cash flow a vacation in the fall (as opposed to doing what we likely would have done in the past and charging it) but we are on track to be under $4K on the loan by the time hubby’s work contract ends in August! woo!